Schedule a consult with Executive Data Chefs at SAPInsider in Prague! You’ll easily find them, because they’ll be on the show floor in a sweet Data Chef coat. We’ll give an overview of the top recipes at this Impact 20 session on Thursday. In the session, you’ll learn how to pull data technologies from your pantry, add a few new data ingredients, and follow our tried-and-true techniques to end up a with a classic data recipe, like Agile Data Warehouse with a zesty SAP HANA sauce. Want more? Stop by our booth to schedule a 15-minute consult with Chef Don or Chef Tina. We’ll ask the key ingredients in your technology pantry, and what you are trying to accomplish (create a big data warehouse, for example). We’ll will talk you through the tried and true recipe, and offer customizations for your organization and culture. 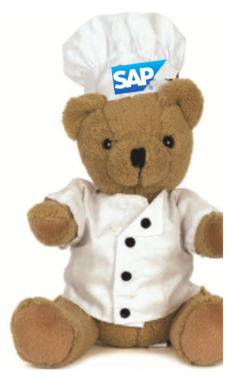 *You* get to walk away with this customized recipe–and a highly-coveted SAP Data Chef teddy bear. We have a few other fun items to help you blend your data life with your cooking life. Stop by to check it out. Can’t make this event? Stay tuned for executive data chefs at events near you. You can also follow the Twitter tag #sapdatachef to get introduced the chefs and learn how they interpret essential data recipes. Or download the complete data cookbook at sap.com/datachef.